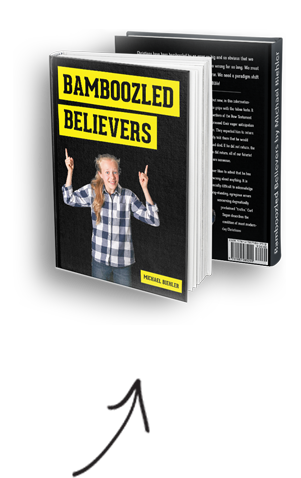 If you are interested in first three parts of this series you can access them here: Bamboozled Believers’ Big Bible Blunders [Part 1of 5], Our “Last Days” Blunder [Part 2 of 5], Our “New Heaven and New Earth” Blunder [Part 3 of 5]. But, what about the Judgment Day? According to futurist, “end of the world” dogma, when Jesus comes again, there will be a great white throne judgment. Jesus will separate the sheep and the goats. Some go to heaven and some to hell. If that scenario is correct, then we don’t go to heaven immediately after death…we have to wait for a future Judgment Day. And if the dead have to wait for judgment at the time of a future coming of Jesus, then they must be waiting somewhere. Presumably they wait in the same place as the rich man and Lazarus. The Greeks called that place “Hades”! Are you headed for Hades? This aspect of futurist eschatology gives rise to some questions. Where are Lazarus and the other Old Covenant saints right now? Are they still waiting in Hades? Why would they have to wait there? They have been redeemed… right? Have they been resurrected? If so, when? Daniel Chapter 12 answers these questions…but you’ll have to read Bamboozled Believers to learn more about that taboo text. At about the same time Peter said that Jesus was “ready to judge the living and the dead” (1 Peter 4:5). Has he been standing at the door, ready to judge for 2,000 years? Jesus told his disciples that he would return “in the glory of his father, with his angels” and “reward every man according to his works” (that sounds like Judgment Day doesn’t it?) And he said that he would return before all of them had “tasted death” (Matt. 16:27,28). So, isn’t that a prediction of a first century Judgment Day? In Revelation 20:11-15 and 21:1, we see that the dead are judged when the old heaven and old earth pass away and as we saw earlier, the old heaven and earth passed away in AD 70. So the Judgment Day happened at that time too. Dear reader, you will not have to wait in a holding tank for a future Judgment Day. Paul said, “absent from the body is present with the Lord.” The Judgment event, that the pseudo-prophets project into our future, actually happened almost 2,000 years ago.